The Banner, Vol. 5, No. 1 – Too Late to Get Earnest? We live in interesting times, a human world in deep conflict. Will our interest in life itself win over mankind’s idolatry of continuous growth and profit? We will explore both sides of that coin. The New York State Department of Environmental Conservation (DEC) has developed a stakeholder regulation outline for new requirements in the oil and natural gas sector (the “rule”). The United States Environmental Protection Agency (EPA) published “Control Techniques Guidelines for the Oil and Natural Gas Industry” 1 on October 20, 2016. The Control Techniques Guidelines (CTG) set minimum requirements in determining reasonably available control technology (RACT) for volatile organic compound (VOC) emissions from select oil and natural gas industry emission sources. Some proposed requirements in this regulation outline go beyond the CTG to address methane emissions as well as New York air quality and nonattainment area concerns. This stakeholder document outlines what DEC is considering for a state regulation. In addition to the specific requests for feedback outlined in the document below, DEC will consider and evaluate all comments, general feedback and questions. The most effective Public Comment letters typically address shortcomings and omissions in DEC’s proposed regulation: what should be regulated, what should be the tolerances for emissions, what mechanisms or procedures should be required to reduce emissions. Regarding “letter on CNG transport,” We are in a crucial time when methane’s immediate impact on the climate cannot be over-stressed. In this letter, the writer stresses the imperative that all transport of methane be regulated, including the CNG (Compressed Natural Gas) transport sector. The 12 CNG transport truck accidents which have occurred during the past two years of operation are enumerated. In “Leak-detection-letter” the writer criticized the DEC’s proposal for quarterly leak inspections, making the point that this world cannot be nearly as leaky as it has been, and gas drilling, transport, distribution and municipal facilities must be under continuous monitoring. Sir David Attenborogh is quoted regarding the dire nature of the situation we face, “Right now we are facing a man-made disaster of global scale, our greatest threat in thousands of years: climate change. If we don’t take action, the collapse of our civilizations and the extinction of much of the natural world is on the horizon.” The time for half measures is past. Continuous bleed natural gas driven pneumatic controllers. These devices are likely to be found at all levels of methane handling, from well-head to pipelines, valves, compressor stations, as well as distribution and faclities. A leak rate of 6 cubic feet/hr translates to .83 tonnes of methane per year. Multiplied by thousands of these devices (or more), would result in 830 tonnes/year contribution to other more difficult-to-control leakage. Wherever possible these should be driven by inert gases such as Nitrogen. ASTORIA, N.Y. ― The transformer explosion that illuminated the New York City skyline late Thursday night came from one of the state’s dirtiest plants, casting new light on the city’s dependence on antiquated oil-burning power stations and bolstering calls for cleaner electricity. This densely-populated area of northwestern Queens provides nearly half the city’s electricity from aging plants that burn number 6 fuel oil, a thick, viscous oil blend considered one of the most polluting energy sources in the world. The Astoria Generating Station, where the explosion occurred around 9 p.m., burns 3,039,000 gallons of number 6 fuel oil a year. The Ravenswood Generating Station, the towering four-smokestack facility on the East River in Long Island City, burns another 3,264,000 gallons per year and was ranked as the state’s largest carbon polluter in 2014. The New York City Department of Health found higher air pollution levels in Astoria and Long Island City than the rest of the borough or city. According to the city’s most recent community health report for the neighborhoods, the levels of PM2.5 ― the most harmful type of particulate matter, fine-grain pollutants that wedge into lungs when inhaled ― hit 8.9 micrograms per cubic meter. That compared to 8.4 micrograms per cubic meter in Queens overall and 8.6 citywide. Local officials have long blamed the plants for higher levels of asthma, and last year the city council passed a bill requiring the utility operators to stop using fuel oil number 6 by 2020 and number 4 oil by 2030. But the explosion on Thursday night could add new pressure to go further, phasing out fossil fuel use altogether and converting the stations to renewable sources. 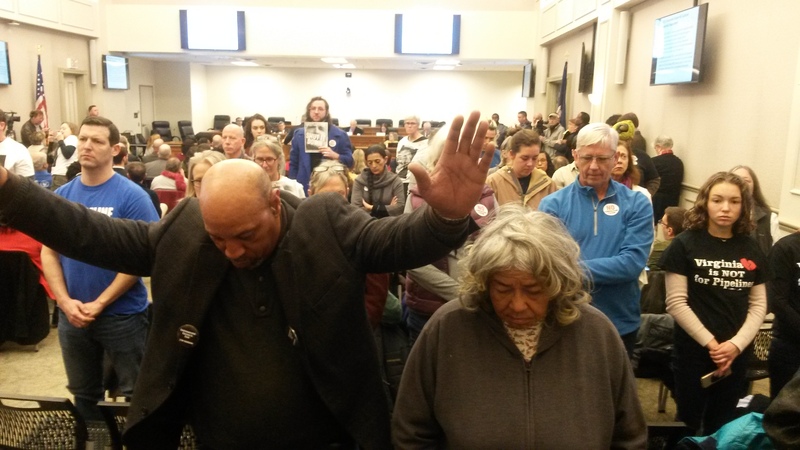 The Virginia Air Pollution Control Board today delayed a highly anticipated vote on the controversial proposed compressor station in the largely black community of Union Hill in Buckingham County. In a packed meeting room of mostly opponents of the proposed Atlantic Coast Pipeline, the board adopted several technical amendments to the draft permit. The board also voted to open a new public comment period for the public to respond to new information submitted to the board by the Department of Environmental Quality over the past month. The DEQ presented new demographic information today, attempting to call into question Union Hill’s status as an environmental justice community. However, community residents say the agency based its findings on flawed methodology. Anthropologist Lakshmi Fjord had previously provided an analysis to the DEQ and the board about the demographics of the community using the Environmental Protection Agency’s preferred research methods. Too Late to Get Earnest? The world’s leading scientists issued a report warning of total planetary dystopia unless we take immediate steps to seriously reduce carbon emissions. Then, oil and gas corporations dumped millions of dollars into the 2018 elections to defeat the major initiatives that could have slightly reduced fossil fuel use. Though you may not know it from the cable TV coverage, this was one of the most significant – and the most terrifying – stories of the midterms. For those who actually care about the survival of the human race, the key questions now should be obvious: is there any reason to hope that we will retreat from “drill baby drill” and enact a sane set of climate policies? Or is our country – and, by extension, our species – just going to give up? Before answering, it is worth reviewing exactly what happened over these last few months, because the election illustrates how little the fossil fuel industry is willing to concede in the face of a genuine crisis. 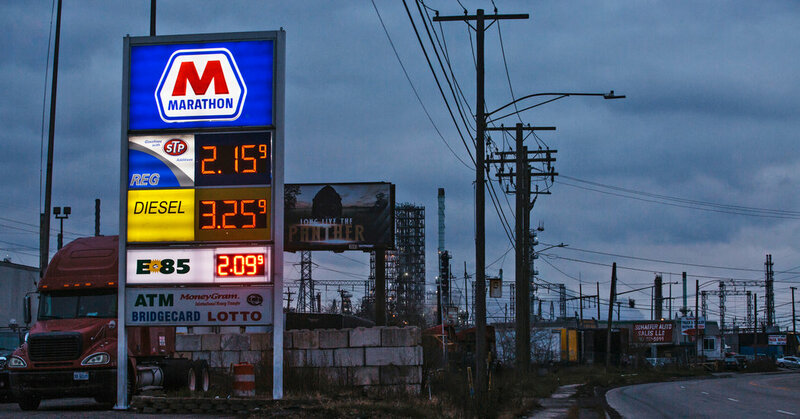 While the dominant media narrative has been about Democratic voters euphorically electing a House majority and yelling a primal scream at Donald Trump, the loudest shriek of defiance was the one bellowed by oil and gas CEOs. As the Intergovernmental Panel on Climate Change warned that we have only 12 years to ward off an ecological disaster, those oil and gas executives’ message to Planet Earth was unequivocal: drop dead. She floated the excuse for inaction I’ve been hearing for at least 30 years: “We aren’t going to get off fossil fuels overnight.” She skirted around a question about the climate impacts of burning the increasing amounts of bitumen government plans to ship to foreign markets. She touted Canada’s biggest fossil fuel venture, a $40-billion, foreign-owned liquefied natural gas project, as a “climate solution” because it could replace coal power. That’s despite research and advice from scientists about how the project impedes meeting our climate targets, the substantial and under-reported release of the potent greenhouse gas methane from LNG and fracking, and the fact that LNG is as likely to slow renewable energy development as to replace coal-fired power. It could be worse. The U.S. president’s response to the IPCC report was, “I want to look at who drew it. You know, which group drew it. I can give you reports that are fabulous and I can give you reports that aren’t so good.” Beyond its inarticulate nature, the comment displays a profound lack of understanding of climate change, the IPCC and the work of climate scientists worldwide whose research informs its reports. 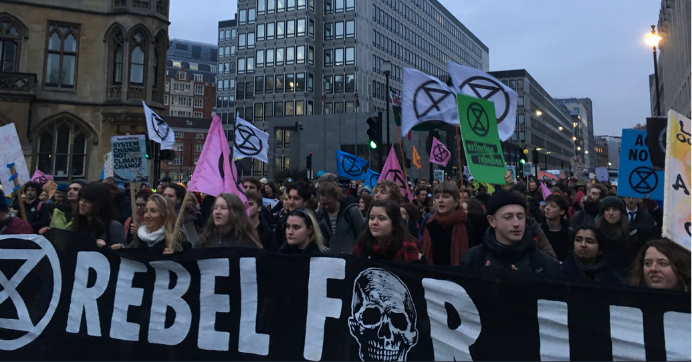 This talk by Gail Bradbrook of Extinction Rebellion will cover two main things: The ecological crisis- the latest science on what risks there are and our current trajectory which includes the possibility of abrupt (i.e. near term dramatic climate change) and human extinction Understanding our emotional response and about appropriate responses. The Trump administration said Friday it will renew mining leases to extract copper and nickel adjacent to a Minnesota wilderness area, reversing an Obama administration decision and giving a victory to a Chilean billionaire who is renting a mansion to the family of the president’s elder daughter. The Democratic administration of former President Barack Obama in its waning days blocked a plan by a company controlled by the family of Andrónico Luksic to build a giant copper-and-nickel mine adjacent to a Minnesota wilderness area, citing environmental concerns. 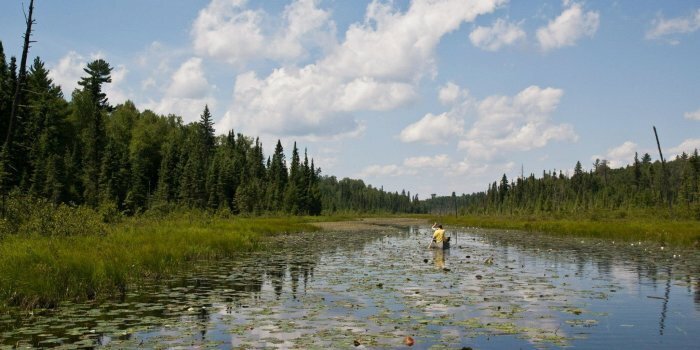 In a 19-page opinion made public Friday, ahead of the Christmas holiday weekend, Daniel Jorjani, the principal deputy solicitor of the Department of Interior, said Mr. Obama’s administration acted “improperly” in not renewing two key leases for the mine adjacent to the Boundary Waters Canoe Area Wilderness, a 1.1 million-acre tract of lakes and forest first protected by the government in 1926. The announcement continues a rollback by President Donald Trump’s administration of Obama-era environmental decisions. Mr. Trump, a Republican, ran on a pro-business platform, promising to promote jobs and lessen what he called burdensome regulations on industry. Mr. Trump’s elder daughter, Ivanka, and her husband, Jared Kushner—both top White House advisers—are paying $15,000 a month to rent their six-bedroom home in the nation’s capital from Mr. Luksic. The Chilean billionaire bought the house just after the November 2016 election for $5.5 million. 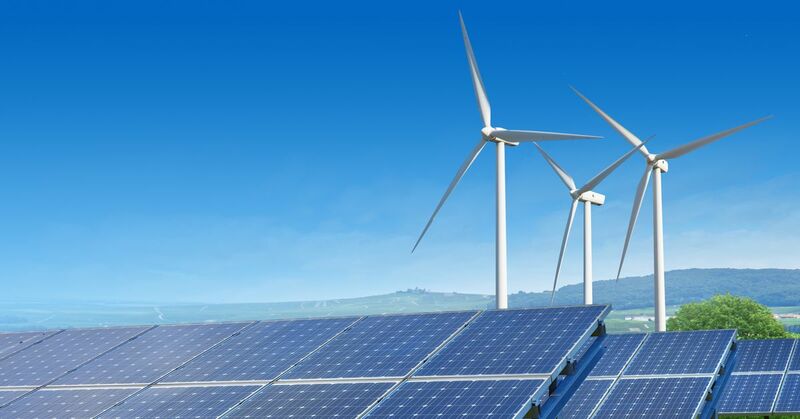 The energy world got some big news earlier this month: Xcel Energy, one of the biggest utilities in the US, committed to going completely carbon-free by 2050 (and 80 percent carbon-free by 2030). Xcel, based in Minneapolis, serves 3.6 million customers across eight states — Colorado, Michigan, Minnesota, New Mexico, North Dakota, South Dakota, Texas, and Wisconsin. Its CEO, Ben Fowke, is part of the leadership at the Edison Electric Institute, the main utility trade group. It is the first major US utility to pledge to go completely carbon-free. 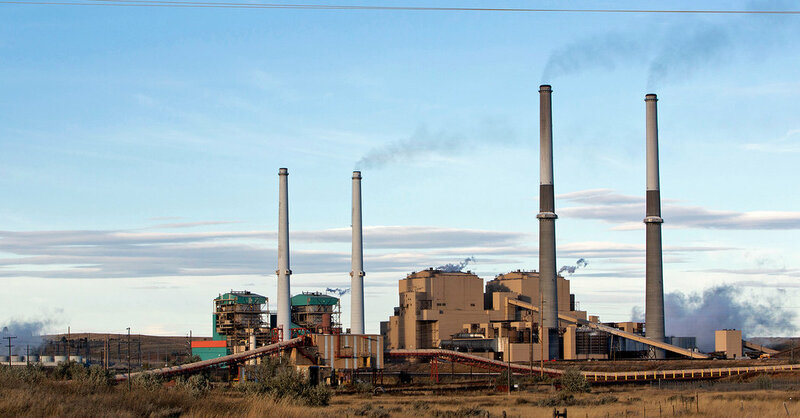 And two days later, Platte River Power Authority, one of Xcel’s competitors in Colorado, announced it would eliminate all carbon emissions by 2030. So make no mistake: This is industry-shaking news. Here’s our explainer, first published December 5. Imagine you are 13 years old, on the cusp of adolescence. You are sitting in a comfortable suburban home, watching a news program about a civil rights protest. Young people, not much older than you, are being beaten with water from fire hoses and attacked by police dogs. The images shatter your comfortable world. You feel angry, confused. You want to do something, but you’re not sure what. When Dylan first hit the music scene, Joan Baez was the reigning queen of folk. She would soon fall in love with both the man and his music — but even today, Baez doesn’t pretend to know what went on in Dylan’s head when he wrote the song “The Times They Are a-Changin’ ” in 1963. Though it may have become an anthem, she doubts that’s what he set out to create. Ecuador’s Energy Minister, Carlos Pérez García, announced on Monday that the government will not pursue oil drilling in protected areas of Yasuní National Park, at least for now, reversing plans revealed last month in a leaked draft decree. The minister indicated that the decision was made after meeting with Amazonian indigenous women and environmental group Yasunidos, who oppose drilling in the “buffer zone” of Yasuní, a zone created to protect the Tagaeri and Taromenane, nomadic indigenous peoples living in voluntary isolation. Minister Pérez did indicate that the government will continue to pursue oil drilling outside the buffer zone. The Minister also revealed that the government no longer plans to hold the “Southeast Round” oil auction during President Moreno’s tenure, another walk-back of previous plans. Pérez also made what appears to be the Moreno administration’s first public acknowledgement of its dispute with Andes Petroleum over Blocks 79 and 83 in the Amazon. The administration and Andes, a wholly-owned subsidiary of Chinese state-owned companies, disagree over the terms of the company’s desire to withdraw from its current exploration contract. The area covered by the two blocks is home to the Sapara people, who have waged massive resistance to drilling there. 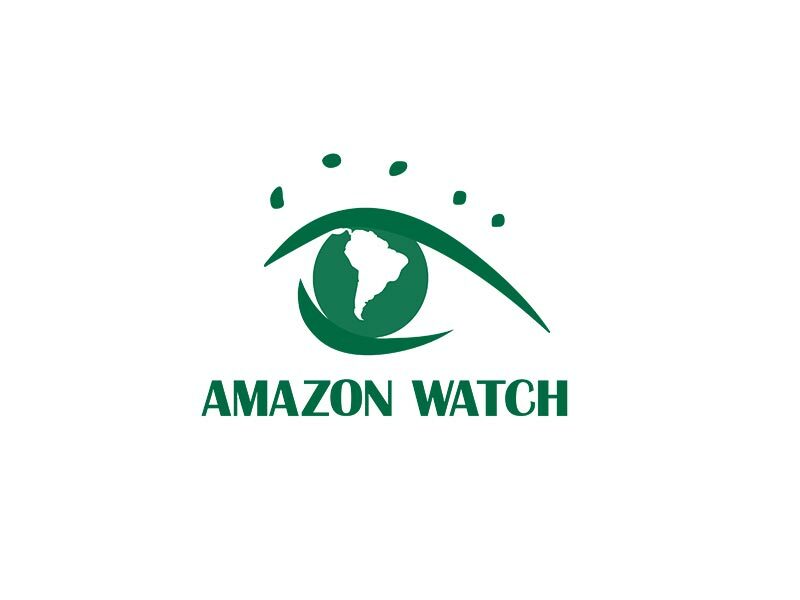 Minister Pérez’ announcement sends a clear message: civil society pressure to defend rights and ecosystems works, and expanding the fossil fuel frontier deeper into Ecuador’s Amazon presents risks to companies and problems for the state. This is an important victory for our collective work to keep fossil fuels in the ground from California to the Amazon. The initiative is seen as a way of providing large-scale crop production for a growing global population. Advocates say subterranean farms could yield up to ten times as much as farms above ground. President of the World Society of Sustainable Energy Technology, Prof Saffa Riffat, believes the scheme would be a cost-effective way of meeting the growing need for food. 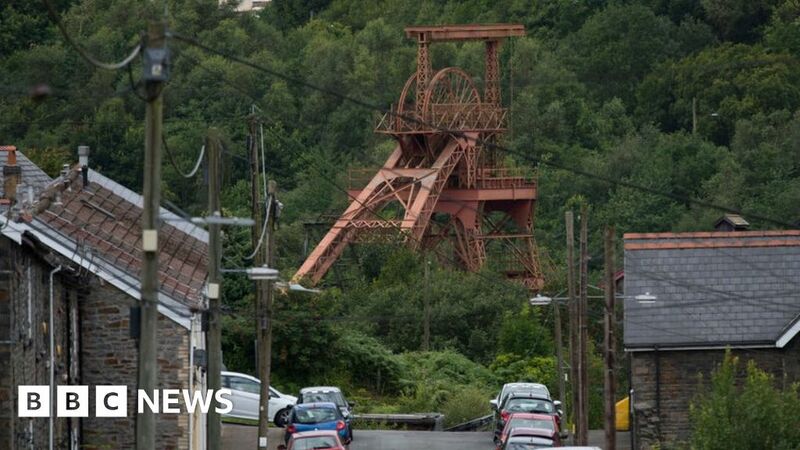 It could also breathe new life into many mines that have been closed since the decline of the UK coal industry in the late 1980s and offer a cheaper alternative to vertical farming in giant greenhouses. The idea has already gained support from mine owners, including the Land Trust and Coal Authority, while the Chinese government has also expressed an interest. There are an estimated 150,000 abandoned shafts and 25,000km-sq of disused mines and tunnels in the UK. Further reading Could we start farming underground? Interior Secretary Ryan Zinke and his political appointees have overseen relentless attacks on science and put our nation’s parks, health, and wildlife at risk. During the first two years of the Trump administration, Secretary Ryan Zinke and his political team have unleashed constant—and ongoing—attacks on science, from sidelining the work of the agency’s own scientists to systematically refusing to acknowledge or act on climate change. 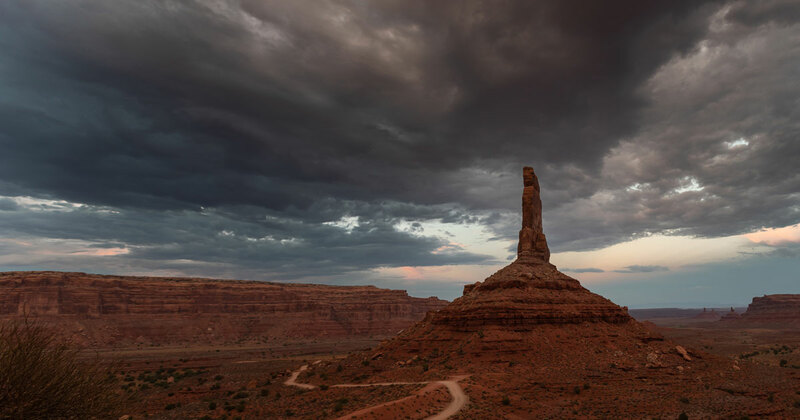 These actions have far-reaching and serious implications for our health, the environment, and the future of our public lands. 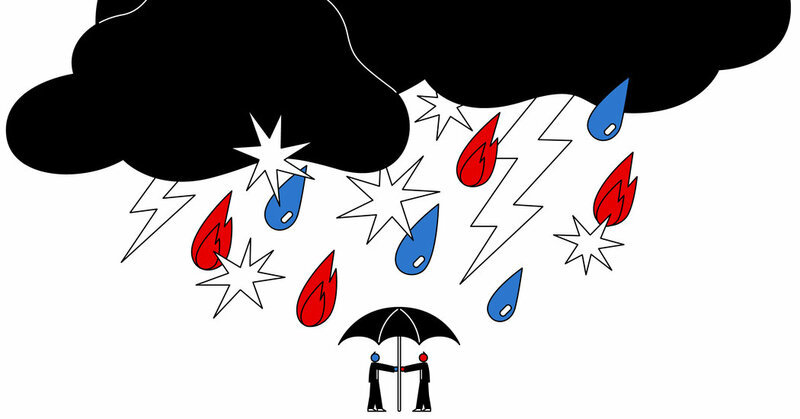 New polls suggest Republicans’ views on global warming may be at a tipping point. 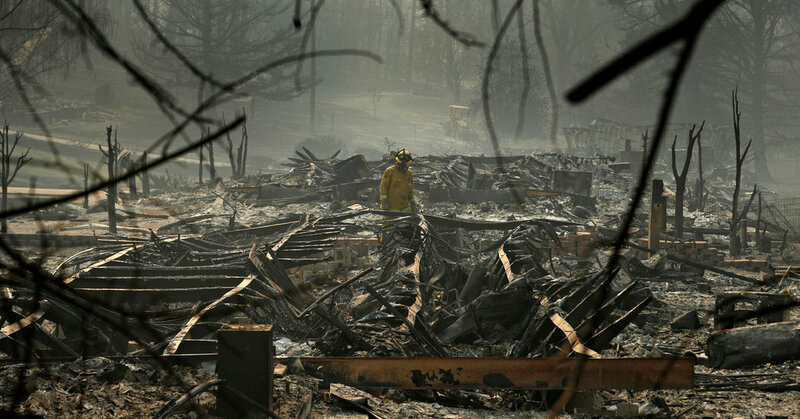 In March, well before the most destructive wildfires in California history, the Yale Program on Climate Change Communication and the George Mason University Center for Climate Change Communication polled 1,067 registered voters on climate change. The study found that while they disagree on the cause, majorities in both parties agree that the world is experiencing global warming and call for government action to address it. The poll asked whether the United States should “set strict carbon dioxide emission limits on existing coal-fired power plants to reduce global warming and improve public heath,” even if “the cost of electricity to consumers and companies would likely increase.” Eighty-seven percent of Democrats and 56 percent of Republicans said yes. Arlie Hochschild is a professor emerita of sociology at the University of California, Berkeley, and the author of “Strangers in Their Own Land: Anger and Mourning on the American Right.” Her son, David Hochschild, is a member of the California Energy Commission, the state’s energy policy and planning agency. Coastal GasLink, the TransCanada Corp. subsidiary that is building the $6.2 billion natural gas pipeline for the LNG Canada project, has filed for a court injunction against the Unist’ot’en protest camp south of Houston, B.C. As part of a permanent occupation that has been in effect since about 2010 to block a number of pipeline projects, the Unist’ot’en have blockaded Morice River Bridge, which is part of a public access road. Coastal GasLink says it needs to get across the bridge to begin work on the pipeline, the corridor for which is about one kilometre from the Unist’ot’en occupation camp. 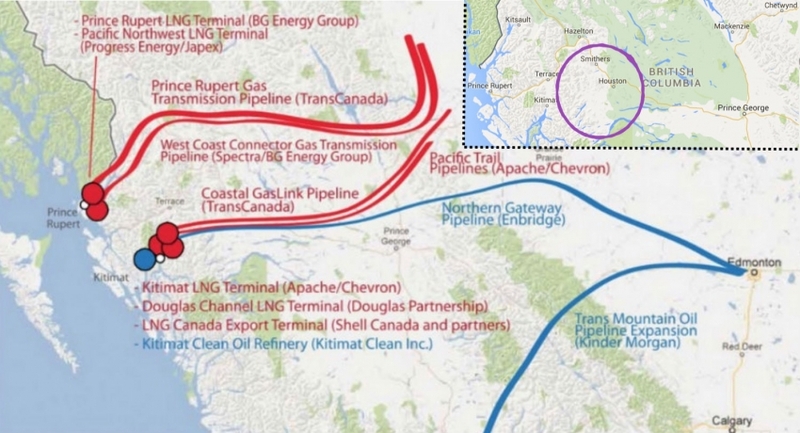 The large map, provided by the Wet’suwet’en First Nation, shows the tentative routes of five major pipeline proposals (natural gas in red, oil in blue) that if approved, would run straight through Wet’suwet’en territory. The small map, pasted in the corner by Vancouver Observer, is a rough outline of Wet’suwet’en land. Click for full size. According to a Unist’ot’en news release, the company has also filed what they call a “SLAPP suit” (strategic lawsuit against public participation) against the occupation’s leaders in the form of a claim for damages. The Unist’ot’en are a clan of the Wet’suwet’en First Nation, which has a benefits agreement with TransCanada on the Coastal GasLink pipeline. But the Unist’ot’en themselves remain vigorously opposed to any pipeline development in what they say are unceded lands. “The Unist’ot’en Camp is not a blockade, a protest, or a demonstration – it is a permanent, non-violent occupation of Unist’ot’en territory, established to protect our homelands from illegal industrial encroachments and to preserve a space for our community to heal from the violence of colonization,” the group said in a press release. Affall is a small and clear spring water stream located just east of Hvolsvöllur, about 120 km from Reykjavik. Due to a connection with the Markarfljót River, the Affall was formerly very glacial colored. After blocking up the connection some years ago, it has become a clear spring water stream. The river is about 20 km long with about 77 pools designated for fishing. Salmon has been bred in the Affall River since 2002, and annually about 700 salmon are caught. Long long time ago the whole Earth was covered with water. Water flows, shapes its way, and passes off, influencing our life. Starting from melting glaciers, water searching his way to find a sea. Through the rocky mountains, muddy marshes and the dry areas rivers finish their ways in beautiful estuaries. This is what the WATER.SHAPES.EARTH is about. It is art of the water shaped planet. 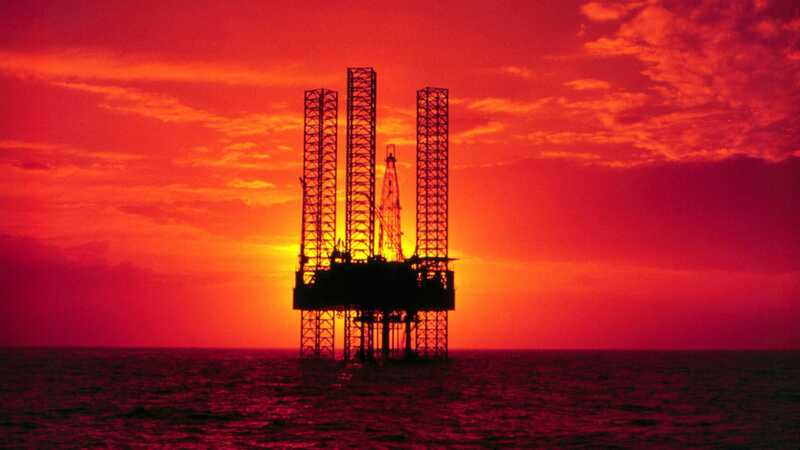 The war against offshore drilling continues to pit basically the entire U.S. against the Trump administration and its plan to open vast swaths of the ocean to fossil fuel interests. On Thursday, nine attorneys general from coastal states joined the opposition by signing onto a lawsuit looking to invalidate seismic testing permits. The suit was filed by environmental groups in federal court last week and argues that five companies that recently received permits from the Trump administration are illegal under a number of federal acts, including the Endangered Species Act, the Marine Mammal Protection Act, and the National Environmental Policy Act, over the use of what’s known as seismic air guns. In order to determine if there’s oil in them there ocean tracts, companies will trawl the ocean and blast compressed air underwater. How that air interacts with the ocean bottom and rock beneath can provide a pretty good idea if there are oil and gas deposits to tap. The blasts are also incredibly disruptive, and can stress out and kill everything from huge whales to tiny zooplankton (to say nothing of the climate impacts of burning whatever comes out of the ground). The suit itself specifically calls out impacts more testing could have on a number of species, including the endangered North Atlantic right whales that migrate and breed in or around the area covered by the permits. Listen to sound of a blast and you may see why these air guns are likened to air canons. Dilemma: Climate Education is Screwed Up! Climate Education is Screwed Up! In a world first, a small robot was deployed to plant thousands of baby coral in a mass re-population project for the Great Barrier Reef in Australia. The LarvalBot is a briefcase-sized underwater drone that recently dispersed over 100,000 microscopic heat-resistant coral larvae across damaged segments of reef. In a bid to protect the marine life from climate change, the coral larvae was derived from species that have been shown to be especially tolerant of warmer waters. Scientists will monitor the reefs during the coming months to ensure that the larvae grows properly – and if it proves to be successful, researchers plan on developing the LarvalBot so that it can deploy millions more coral larvae in the future. Furthermore, they hope to deploy a small army of LarvalBots that will be able to repopulate coral reefs around the world.